Capidji Bachi their dress of ceremony. Home » Capidji Bachi their dress of ceremony. Capidji Bachi. Officers of the Sultan’s guard in official attire. Capidji Bachi. Officers of the Grand Signior. 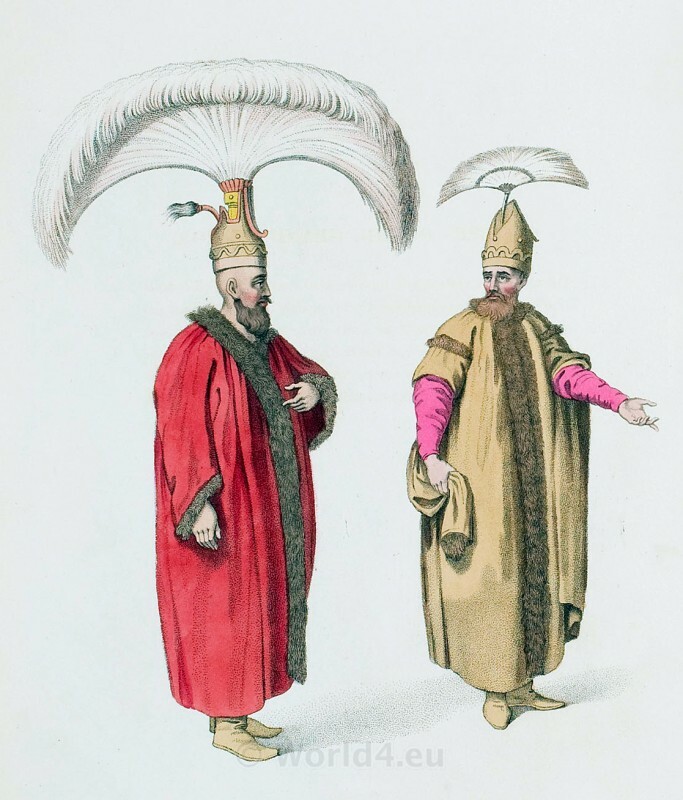 THESE officers, who are in their dress of ceremony, which consists of rich silks, trimmed and lined with valuable furs, and with a singular crested plume on their heads, are called Capidji Bachi, and are for the private service of the Sultan. To them is attached the honor of carrying the bow-string, when the monarch orders them; and their appearance, therefore, with that instrument in their hands, is dreaded by all. This entry was posted in 1804, 19th Century, Military, Ottoman Empire, Turkey Costumes and tagged Octavian Dalvimart, Ottoman Empire costumes, The costume of Turkey, Turkish Military Costume on 7/30/13 by world4.